A Nigerian nongovernmental organization, Women for Positive Peace Building Initiative (WOPPI) on Thursday called women to actively participate in the forthcoming general elections in the country. Executive Director of the organization, Mrs. Lantana Abdullahi said women can only influence change in the Nigerian political system if they practically vote during the polls. The focus of WOPPI therefore was to enlighten women on these and other roles such as advising youths not to be used for electoral violence, said Mrs. Abdullahi at a town hall meeting with gender-based civil society organizations in Jos, the Plateau State capital. The program which was in partnership with the Independent National Electoral Commission according to her aimed to sensitize women who would further sensitize others on the need for active and peaceful electoral decisions. An official of INEC at the forum, Mrs. Chinyere Okorie told the women to never allow any politician influence their electoral decisions by giving them money or any other gift. According to her, adequate security measures have been put in place to guard against any threats during the polls. Women therefore have every security to freely vote the candidates of their choice without intimidation on the election day, Okorie, the INEC Gender Desk Officer said. Meanwhile, the Independent National Electoral Commission, INEC on Thursday staged a public rally to call for public participation in the forthcoming polls. 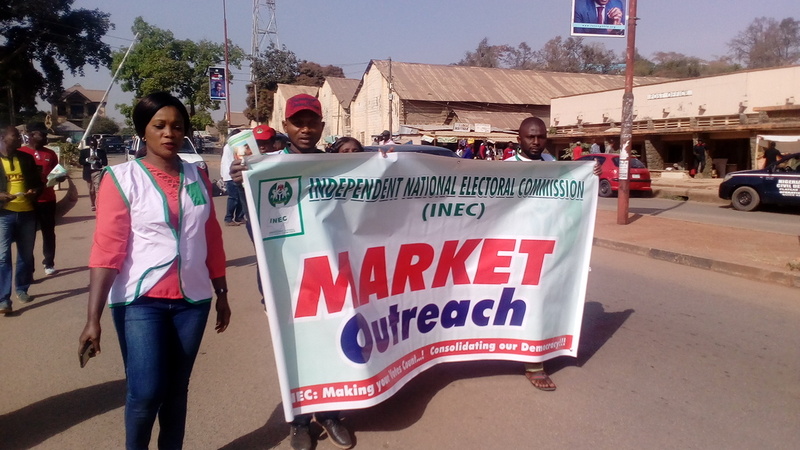 The body in collaboration with the Nigeria Union of Journalists distributed fliers with anti-vote buying messages to traders, motorists and commuters in commercial centres in Jos the Plateau State capital. The rally was part of INEC's voter education programs ahead of the 2019 polls starting February 16.